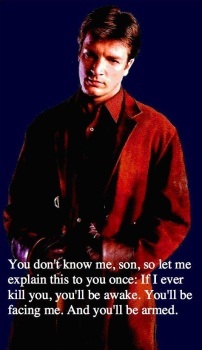 A professor at the University of Wisconsin is facing threats of criminal action for putting up a poster featuring a quote from the sci-fi television series Firefly. "You don't know me, son, so let me explain this to you once: if I ever kill you, you'll be awake. You'll be facing me. And you'll be armed." If you're a Firefly fan, that quote will be instantly recognizable as one spoken by Captain Malcolm Reynolds, explaining to a new passenger one of the many interesting philosophies that governs his life. It also apparently had some resonance with Professor James Miller of the University of Wisconsin, who hung a poster featuring that quote and a picture of Captain Reynolds, also known as actor Nathan Fillion, on his office door. But on September 16, he received an email from University Police Chief Lisa A. Walter, telling him that she had taken the poster down because "it is unacceptable to have postings such as this that refer to killing." When Miller complained, Walter told him, "The poster can be interpreted as a threat by others and/or could cause those that view it to believe that you are willing/able to carry out actions similar to what is listed," and furthermore, that if he put it back up or posted anything similar, he could be charged with disorderly conduct. So Miller, a theater professor, replaced it with a different poster: a silhouette of a riot-gear-clad policeman putting a beatdown on someone, with the caption, "Warning: Fascism. Fascism can cause blunt head trauma and/or violent death. Keep fascism away from children and pets." A few days later, that poster was gone too and Miller received another email from the chief, saying it was taken down because it "depicts violence and mentions violence and death." And this time around, the university's "threat assessment team" was called in and concluded, in consultation with the University General Counsel's office, that the poster could be reasonably expected to "cause a material and/or substantial disruption of school activities and/or be constituted as a threat," and should therefore be removed. Raymond Hayes, the interim Dean of the University's College of Arts, Humanities and Social Sciences, has arranged a meeting with Miller on September 30 to address "the concerns raised by the campus threat assessment team." The day after his second poster was removed, Miller took the matter to the Foundation for Individual Rights in Education, which contacted University of Wisconsin Chancellor Charles W. Sorenson with a request that the university stop censoring Miller, apologize for threatening him with criminal charges and cancel the threat assessment meeting. "Colleges and universities are supposed to foster brave and bold environments of freewheeling intellectual inquiry and expression. If a quote from a network science fiction show is a bridge too far, something has gone seriously wrong," said FIRE President Greg Lukianoff. "As both president of FIRE and a huge Firefly fan, I call on the chancellor of UW-Stout to rein in his overreaching administration and to restore both free speech and basic common sense." As of press time, Sorensen had not responded to the request.